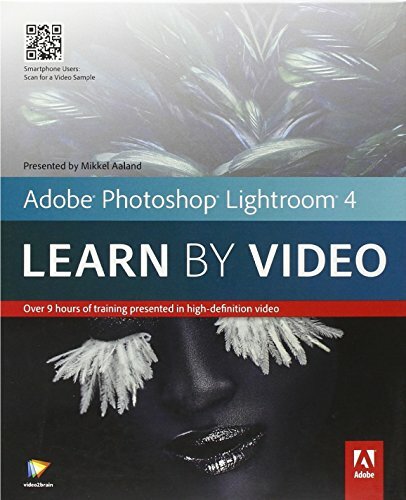 This complete training program from Adobe Press and video2brain combines over 10 hours of exceptional video training with a full-color 48-page guide to teach you the fundamentals of Adobe Lightroom 4 as well as the basic principles of image processing and management. Award-winning photographer and teacher Mikkel Aaland walks you through the main features of the program, showing you how to import images, apply keywords, and create Collections; then moving on to the Develop module, where you use sophisticated controls to bring out the best in each image. Mikkel also shows you how to export your photos to print, the Web, or to other media. The course includes extensive coverage of what’s new in Lightroom 4 such as the Map and Book modules, and vastly improved image processing engine. The lessons are wrapped in a feature-rich interface that lets you jump to any topic and bookmark individual sections for later review. Full-Screen mode provides a hi-def, immersive experience, and Watch-and-Work mode shrinks the video into a small window so you can play the videos alongside your application. As with all titles in the Learn by Video series, the project files used in the lessons are included with the course, and interactive review questions help reinforce what you’ve learned. Selected videos are also provided ready to be downloaded for viewing on your iPhone, iPod, or other compatible mobile device. Mikkel Aaland is an award-winning photographer, a popular workshop leader, and the author of ten books. He’s lectured on digital photography at many universities as well as at conferences around the country. Mikkel’s documentary photographs have been exhibited in major institutions around the world, including the Bibliothèque Nationale in Paris and the former Lenin Museum in Prague. video2brain, a firm located in Graz, Austria, produces high-quality video training content on software, photography and programming topics. Crucial to the flexible training are optimized teaching methods, practical tips from industry experts and the focus on "learning-by-doing" with project files. video2brain is an Adobe Certified Training Provider.